She recently moved into an office, travelled to the other side of the world and rebranded her business.. Talk about all things new! Lianne is the Graphic Designer and Art Director behind her personal brand Lianne Charlene Creative specializing in brand building, print & digital design, campaign development and infographics. She works with different kinds of businesses such as local coffee shops, ice cream brands, beauty and government companies, etc. Since this post has to do with building connections, here’s our story: I was planning on reaching out to interview her for this series but put it off since she was travelling at the time. But voila, she messaged me on Instagram saying she would love to connect when she get back after seeing one of my business card photos. I got so excited! She gave me a tour of her new office which, let me say, is one of the most beautiful places Ive been to. It’s obvious that she’s a designer with how furniture and details were arranged. The room felt like 10x bigger than it actually was and I adored her art prints! I know I always say this because it is true and I easily seek and find things to be inspired by, but I loved seeing her at her office. I think it’s also why I love it when people online share their workspaces, even if it’s just their living room couch. I could imagine them when no one is watching, just doing what they enjoy most and calling it a career. After that, we went to grab coffee from a cafe just next to their building to get to chitchatting. And we did, A LOT. 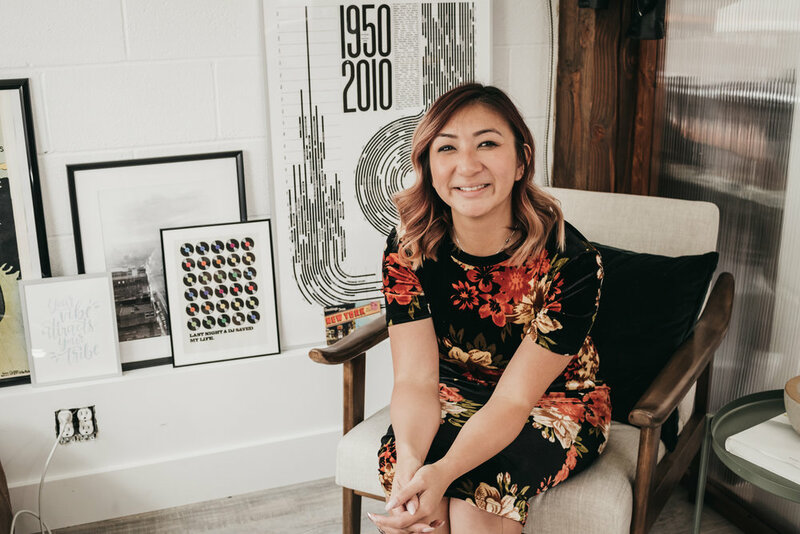 Amongst what we talked about in this interview are her business journey (gosh, I’m a sucker for these stories), lead generation, her brand development process, and (my favorite topic that we discussed!!! ), building relationships with other small businesses. I’m all about connecting with like minded people and finding a community (even if you have to build it yourself! Get your favorite cup of latte and join us for this conversation! 1. How did you get into design? Walk us through your story from wanting to be a ballerina to being an entrepreneur. My story is a bit of an uphill climb and kind of like a marathon haha I didn't know I was going to be a Graphic Designer let alone an entrepreneur. I was put into Ballet at a very young age (2) and it became the main focus of my childhood and teenage years. I was training towards becoming a professional ballerina when I injured myself at 17 and was forced to take a few months off. At the time, I loved Ballet, but not enough to make it my career and to constantly endure injuries and body issues. I was also considering University and the injury became an opportunity to change my career path through post-secondary education. My first choice was Fashion Design; Art class was always my favourite and fashion was something ingrained in me through my mom (she always loved fashion and would put me into modelling contests as a teenager....haha I never won but fashion became a part of my life because of that. I even organized two fashion shows in high-school!) Naturally, this lead to applying to fashion school. But because of my lack of sewing skills, I couldn't get into any programs so I decided to stick to visual design. I went to the University of Alberta for 2 years in Psychology and took a few electives in visual communications. This allowed me to build my portfolio to apply for design school. I applied to Ontario College of Art and Design and Simon Fraser University. I was accepted at both, but I went with OCAD simply because it was in Toronto. I had always had dreamed of living there as a kid. The program in Toronto was focused on Advertising Design and Art Direction. This is my formal training. But after 4 years towards my degree and a couple of summer graphic design jobs, I felt more connected to Graphic Design than Advertising. After graduation, I applied and worked as a Graphic Designer for a few different companies and corporations. My longest job was spent at Honeywell working in their creative department. I worked on a lot of corporate branding and rebranding initiatives that it became a big part of my skillset. I then moved on to small boutique agencies in Edmonton, working on various projects related to branding, marketing, web design, publication, packaging, collateral and large format signage. Agency life was a good taste of what it would be like to own my own business, having that variety in projects and clientele. I quickly fell in love with it and started working towards becoming an entrepreneur. 2. How was the transition from working full time to eventually focusing on your freelance job and working on your business? For good two years, I would work evenings and weekends on freelance projects and go to my agency job during the day. I would slowly build my clientele, taking baby steps to go out on my own. I was fortunate to have an employer who understood this goal, so I worked part-time at the agency for a few months to get my business up and running. Once I felt I had enough work to go full-time, I took the leap. It also helped to save some money in case freelancing didn't go quite as expected! What was amazing, was once I went full-time, the requests just poured in. Then I just wondered why I didn't take this step sooner! Starting my business was one of the hardest decisions I'd ever made but I can whole-heartedly say that it was 100% worth it. 3. What’s your favourite part about having a business? Meeting new people! I've always been an introvert and would have social anxiety as a kid. Growing up, it wasn't always easy to make new friends. Having my own business gives me that opportunity to connect with people. And not just anyone, but those with similar mindsets. I work with a lot of small businesses and entrepreneurs, and I love being able to connect and share stories with them. I also just love being able to help them; take their vision and put it out in the world -- in a way that let's others connect and share in their passion. There's something truly satisfying about creating a brand, and watching it grow into a successful business, all in-part because of its branding and visual identity. 4. You're leaning more into working with small businesses. Why is that? How would you compare that to working with bigger corporations? I love working with both small and large businesses. In general, if I can help any part of a business gain visibility or improve their visual communications, it's a win. But yes, I am working more with small businesses because I AM a small business. We understand eachother, the struggle, the passion, the day to day. The relationships I build with small businesses are also more personal. There's no middle man and I know that in helping other small businesses, I am helping an actual person I have connected with. 5. From referrals, word of mouth and traditional advertising, tell us about how social media changed the way one can generate leads and connect to clients! I started my business out with referrals. Luckily I had many ex co-workers and friends who believed in me! After a while, I felt the need to put more of myself out there. Like I mentioned before, I'm a bit of an introvert. Social media was never a big part of my life until I started my business. It gives me outlet to share my work and my passion in a less stressful, confrontational way. But it also let's me connect with people in a less traditional way. There are so many like me who have social anxiety who have also taken to social media as a way to connect. As a result, I've met some really amazing people and entrepreneurs. Some I've only chatted with online and others I've had the pleasure of meeting in person. Regardless, it's a way to get to know others with similar interests. When you've created a connection with someone who is starting a business, or someone in need of a designer, it usually turns into a client or a referral. 6. Tell us about reaching out to other creatives and the power of creating connection with small local businesses. There are so many people (women in particular) who are constantly competing against one another. In my industry, there are tons of freelancers and graphic designers. But there's also more than enough work to go around. For me, it's important to create a community amongst other designers and other women who can support one another. We have a hard enough time as small businesses, why not supply one another with the advice and support we could use. Reaching out to a fellow instagrammer is just one step of creating that sense of community in a digitally powered world. And like I said, creating connections is a way for me to reach out and get to know others on a different level, behind the screen. 7. How does your process look like for brand building? Branding for businesses is unique process. In that it is unique for every client. I have my standard process that I use as a general guideline: Consultation/meeting > questionnaire > visionboard > concept development > Revisions > Final. However, every client's needs are different and my approach to branding is a customized interactive process. The biggest hurdle is manoeuvring through the different steps in a way that works with the client's personality. Not everyone has a design background, let alone knows what a Pantone Colour is. There also those rare cases, where you work with someone who has a design background or who have a distinct vision for their brand. I also like to involve my clients. Get their opinions and ideas, and ask them why they do or don't like a particular aspect of the design. This is why templated logos and brands don't always work. You can't purchase a logo for $200 and then expect it to be different from everyone else's. You also don't get that customizable process in which you're able to witness how the logo goes from one draft to the next. Involving my clients is a way for them to feel like they are part of the process; that they've also contributed to the making of their brand. 8. You recently moved into your own office! What prompted the move and how would you compare it to having a home office? Yes! I moved into my office in January! My new space is pretty unique. It is an open concept office in a building made with reuse and recycled material. (My landlord owns an environmental engineering company and has a passion for the environment and recycling). I love the space because of the way it was built. It's a purely creative space that feels like me. It's also a space to be creative away from home. I loved working from home (mainly the rolling out of bed and working in pyjamas part) but I needed a separation between my work life and my home life. As passionate as I am about my business, I am a true believer in self-care. One of my favourite sayings is: You need to take care of yourself first before you can give yourself to others. I believe in this in love and in business. I can't put 100% of myself into my work if I am run down, working until 2am every night, and stressed all the time. Thus the reason to rent an office! The new space also lends it self to expansion in case I ever want to hire an assistant or another designer! 9. What major decisions did you have to make and challenges to work through that has been the most rewarding? Running a business isn't easy. I didn't go to business school. The day to day aspect of running a business has been the hardest for me. Administrative work, forecasting, doing my taxes, answering tough emails and writing quotes and proposals are probably the toughest and least exciting aspects of my job. But having done them for the last three years has made me a stronger business owner and that is the biggest takeaway. The second, learning to identify when a project or client could go sideways beforehand. As a freelancer you always want to take on ALL the work. Sometimes you're just not sure when the next pay cheque will be. But when you get to the point where you no longer need to take ALL the work, the hardest decision is choosing the good projects and cutting loose the bad projects. In this business you won't always make the right decision and sometimes you have to take a leap faith. I've made some bad decisions and cut the wrong client or moved forward with a project that just didn't pan out. What is most rewarding is the learning experience through all of it and knowing what NOT to do! haha And also understanding that "bad projects" are not necessarily bad and understanding what I could have done to improve the process. 10. Looking back at your story, what’s the biggest lesson have you learned along the way? Expect the unexpected and never give up. Have goals but don't plan every single step in life or your business. There are always going to be obstacles and hurdles that pop-up. You also never know where they might take you. I went from wanting to be a ballerina, to wanting to be a fashion designer, to accidentally loving graphic design and then to owning my own business. Who knows what 5 years down the road will look like! Open your heart. This leads to connection and meeting new people (which can sometimes lead to business). Part of my journey has been learning to be more open; with friends, strangers, social media, etc. Following your heart and instinct will also help guide you to where you want to be in life.